The second scenario in our Chain of Command campaign The Winged Horse, following the exploits of the Allied 6th Airborne Division on and immediately after D-Day, took us west of the Orne Canal to the village of Varaville. Elements of the 1st Battalion, 1st Canadian Parachute Regiment, under the command of Major Murray McLeod, were tasked with neutralising a 75mm gun located at a fortified château on the outskirts of the village. You can read more about this action here. This scenario is the second from ‘Red Devils in the Night’, and is called ‘Ex Coelis Chateau’. I must admit, as I started reading some of the accounts of this encounter, I found some of the aspects of the history increasingly at odds with the way that the scenario had been put together. I will discuss these concerns at the end of the Battle Report. The Allied player has a force of 15 paratroopers, led by a Senior Leader (Major McLeod) and including a second Senior Leader (Lt. Walker), a PIAT Team and 12 Paras armed with a mix of Lee Enfield Rifles and Sten SMGs. Some further troops appear later in the game – a third Senior Leader (Capt Hanson), a Bren Gun team and a Mortar Team. The action (according to the scenario) takes place at 01:40 on 6th June, so night rules are in effect. Also, many of the troops are asleep, so the German player has limited Command Dice at the start of the game (we decided that this should be 2 dice, as two German squads are awake at the start of the game). 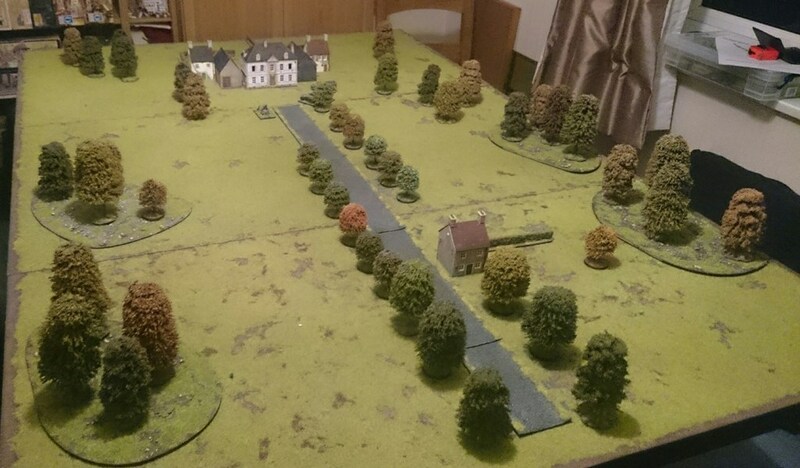 This time, we decided to play the game as the Chain of Command scenario 6: Attack on an Objective, and so we played an initial patrol phase to place jump-off points, rather than the British player simply deploying at the end of the road. For the British, one is place at the end of the road, a second is place on the bottom centre-right of the picture, behind the second wood, whilst a third is placed in the wood on the opposite side of the table. The Germans ended up with all their JOPS in the château complex, with a fourth in the main chateau building. The Germans then deployed a squad of sentries on their right flank, next to the château outbuildings. When we discussed this after the game, Dave was very surprised that I deployed this unit here. However, I was basically following the scenario instructions that a single squad was patrolling the grounds, so I thought I’d place them where they could quickly raise the alarm. Nineteen hits in total left the German Sentries with 3 dead and a further 6 points of shock. Unsurprisingly, the unit was pinned down by the volume of fire. The Germans finally seemed to wake up. The remaining sentries returned fire, though probably due to the fact that they had been severely mauled in the last phase, their fire was wild of the target. My Force Morale was reduced by 2 – 1 for the squad breaking, and 1 for the wounded Leader. The Paras advanced out the arc of fire of the front of the château, even as the mortar fired again (this time with no effect) – yes, Dave had got another consecutive phase. Crucially, they were now within 4″ of a JOP, thus denying its use to the Germans. Now was the time to strike swiftly for the Germans – if I could catch the Paras in the open at short range, I might be able to do some real damage. I rolled the Command Dice and could not believe it: I was unable to order a single unit. The Paras advanced further, firing as they came. For once their fire went wide of the target. a second group of HQ staff appeared along the hedge line, spraying the Paras with fire from their MP40s. They caused a couple of casualties and some shock, but most of the fire missed it’s target. This was the critical point of the battle. Faced with an enemy at point blank range, the Paras engaged the German SMG squad with grenades and automatic weapons fire. The PIAT Team jumped the hedge and seized the JOP. At this point, Dave used a Chain of Command Dice to end the turn. The result was severe. The JOP was lost, and the Junior Leader was routed from the table. Force Morale dropped by 4 points! Even worse, I was forced to remove a JOP from the table. With Force Morale reduced to a single point (and the Paras still on 11), I decided that there was little point in continuing the fight and the garrison in the château surrendered. So where did it all go wrong? I really thought that with a reduced force the Paras would be really up against it, but this did not prove to be the case. Using the Patrol Phase meant that the Paras could close the gap to the château quickly, and so were on the defences before they could be spotted by the sentries. The scenario hamstrings the Germans with the placement of the squads (I reasoned that because a sentry unit was deemed to be patrolling the grounds, I had to deploy them in the open – after all, they didn’t know the Paras were there! ), and the amendments to the Command Dice that we introduced to represent surprise give the Germans little chance to react quickly, unless you roll dice well. At crucial times I was unable to order any troops at all, essentially giving Dave something like 5 or 6 unopposed phases to do what he liked. His reinforcements never got in the game – but they didn’t need to. My use of the squad from the gate house was questionable. I reasoned that they would rush back to the château – towards the sound of gunfire – and not towards the Bren and Mortar teams (who were in a wood, in the dark, so I reasoned that they could not be seen from the road where the squad were). I could have used this squad to capture the Paras JOPs – two were undefended and within a couple of phases movement – but this, at least to me, seemed a bit ‘gamey’, and the fact that the unit was there at all was only a scenario special rule. In the end, this unit contributed nothing to the battle. So, an overwhelming victory once again for the Paras. As I mentioned at the start, I do have some issues with the scenario. If you read accounts of the battle on the internet, you can quickly ascertain that the defences around the château were, in reality, much greater than this scenario would suggest. There was a trench system and barbed wire in front of the chateau. Also, even a rudimentary search on Google reveals that the chateau at Varaville looks very different to the building layout depicted in the scenario, so I’m not 100% happy with the accuracy of this scenario. I agree with Dave: I think you were a bit too generous putting a full squad in the open near the outbuildings. I can’t think of any case where you would put a full squad in the open on routine patrolling. And if the alarm were raised, then you wouldn’t all be patrolling in the open anyway. I’d strongly assume that a squad patrolling around the chateau would be in patrolling in spearate groups of one or two, with the leader and the machine-gunner plus one (as a minimum) in some defensive position. Not that anything you could do would make much difference when Dave was rolling like that haha! One thing to remember is that we were playing with night vision rules, so when I deployed that squad in the open, the Paras couldn’t see them. Also, everything in the open is effectively in light cover. Might have been better to set the Germans up with a mix of dug in pickets and mobile patrols. A real unit would almost certainly have dismounted their MG42 and put it in a gun pit commanding the road. The road would have a VCP, and there would be at least another couple of outposts and probably wire, with a foot patrol commanded by an NCO connecting the dots. Then you’ve got the reaction force whose standing orders would be to man some more trenches and form a strong perimeter. Really interested in your night and sentry rules, they’re a great addition for raids by paratroopers and commandos. Planning to do a mini-campaign for Paras in Italy later this year. Awful command dice for the Jerries though! How I bet you laughed! As I said, having read the scenario and checked the map, and then read the reports of the action from a couple of sources, the German defences (or lack of them) in this scenario were somewhat obvious. If this was a ‘standard’ Chain of Command game, then it would have been logical to purchase wire and trenches with support points, but we are playing the scenarios ‘as written’ with a few tweaks for the rules, so this simply wasn’t an option. However, as I said, we will be coming back to this particular battle, as there are two scenarios in the Skirmish Campaigns Red Devils of the Orne book which cover the same battle – firstly the assault on the Gatehouse and 75mm gun position by the Paras, and then it’s subsequent defence from approaching German reinforcements by the British Commandos, who had reinforced the position after they had arrived from Sword Beach. The scenario map for these two battles is very different, with lots of trenches, MG positions and wire for the attackers to contend with! We probably won’t be playing this battle until the autumn, but I will be sure to flag it up when we do. I get that you’re adapting some pre-written scenarios, Neil. Just suggesting that you could treat the scenarios as inspiration, rather than being bound to follow them verbatim. Especially as in this case where your own research has given you cause to question what’s in the book. The one thing we did note with the scenario maps from RDitN – they seem a bit sparse on terrain. We are used to fighting over an area that has a lot more terrain. Sounds to me like a fairly realistic outcome with a surprise night attack. Maybe some consideration should be given to the sound of aircraft overflying and possible sighting of parachutes by the sentries. Having read the report of the actual battle, it seems that the garrison had indeed been alerted to the presence of something going on – the Gatehouse was empty when the Paras arrived, though it showed signs of very recent occupation. The entire garrison was awake and the initial exchanges of fire was quite intense. Having read this and your other scenario you might want to consider one of the alternative rules for Elite activation dice. My preference which has worked well in the past is to use a different coloured sixth dice for the paras. This dice ignores any 5 and 6 rolled so does not add to chain of command dice or consecutive turns but does help with command and control activations. This tends to stop the multiple phases that elites tend to get but still affording them better control. Where was this alternative rule from? The TFL forum? It speaks volumes for CoC Neil, that you keep getting a pasting but come back for more every time. Some time I must get my 8th Army and DAK painted up as I still haven’t played it! I’m looking forward to the time when I am not facing ‘Elite’ troops with 6 CoC dice. Maybe when we start with US Paras Vs Fallschirmjager around Carentan the boot will be on the other foot. But yes, CoC is a great game.